A large billboard advertising Weihenstephan beer with a slogan saying Thirsty for Life in Freising, Bavaria in Germany makes for a great picture. 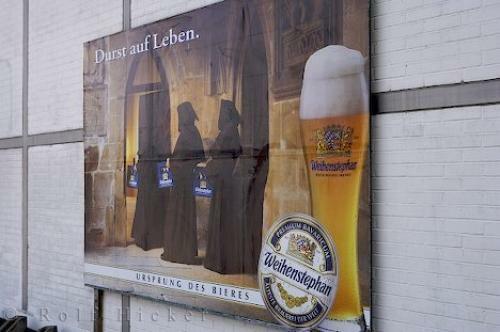 Advertising is a huge part of what makes something a profitable product and this sign promoting Weihenstephan beer in Freising, Bavaria in Germany speaks for itself. The slogan on the advertisement also aids in the promotion especially when you have a catchy line such as this one that reads "Thirsty for Life". The taste of the beer is another sign to success and Weihenstephan has a reputation that is hard to beat. Many awards have been won over the years due to the fact that this beer is premium quality and the flavors of each type of beer is unique. There are many hidden secrets to making good beer and the Weihenstephan brewery has many of their own to keep winning awards. When you see this funny sign posted around Freising, Germany, be sure to follow its lead and try a cool, refreshing beer while enjoying every sip. Photo of a sign with a great slogan for Weihenstephan beer in Freising, Bavaria in Germany. Pictures from photo gallery "Freising Pictures"
This picture is part of the photo album "Freising Pictures" - there are more beautiful images waiting for you. ... While visiting Freising, take a tour around the Weihenstephan brewery, the world's oldest brewery, and sample some of their fine refreshments. Take a picture of your memories of your tour and show your friends at home, only those people who have tried a Weihenstephan beer will know what they are missing. Funny Sign, Thristy for Life, at Weihenstephan, Freising, Germany, Bavaria, Europe, Europe 2006. I photographed this photo with the digital SLR camera model Canon EOS-1Ds Mark II, aperture of f/5.6, exposure time of 1/100 sec. on ISO 100, as always I used a original Canon Lens, the focus lenght for this picture was 45mm.